This huge meat eater was 45 feet long (5 feet longer than T-rex) and weighed 8 tons, making it one of the largest carnivores that ever walked the earth. This African carnosaur had a gigantic 5’4" long skull and enormous jaws with 8" long serrated teeth. It walked on two legs, had a massive tail, bulky body and short arms ending in three-fingered hands with sharp claws. Carcharodontosaurus is one of the longest and heaviest known carnivorous dinosaurs, with various scientists proposing length estimates ranging between 12 and 13 m (39-43.5 ft) and weight estimates between 6 and 15 metric tons. Its long, muscular legs, and fossilized trackways indicate that it could run about 20 miles per hour, though there is some controversy as to whether it actually did, a forward fall would have been deadly to Carcharodontosaurus, due to the inability of its small arms to brace the animal when it landed. Carcharodontosaurus was a carnivore, with enormous jaws and long, serrated teeth up to eight inches long. Tyrannosaurus is a genus of coelurosaurian theropod dinosaur. The species Tyrannosaurus rex (rex meaning "king" in Latin), commonly abbreviated to T. rex, is a fixture in popular culture. It lived throughout what is now western North America, with a much wider range than other tyrannosaurids. Fossils are found in a variety of rock formations dating to the Maastrichtian age of the upper Cretaceous Period, 67 to 65.5 million years ago. It was among the last non-avian dinosaurs to exist before the Cretaceous–Paleogene extinction event. Like other tyrannosaurids, Tyrannosaurus was a bipedal carnivore with a massive skull balanced by a long, heavy tail. Relative to the large and powerful hindlimbs, Tyrannosaurus forelimbs were small, though unusually powerful for their size, and bore two clawed digits. Although other theropods rivaled or exceeded Tyrannosaurus rex in size, it was the largest known tyrannosaurid and one of the largest known land predators. By far the largest carnivore in its environment, Tyrannosaurus rex may have been an apex predator, preying upon hadrosaurs and ceratopsians, although some experts have suggested it was primarily a scavenger. The debate over Tyrannosaurus as apex predator or scavenger is among the longest running in paleontology. Tyrannosaurus rex was one of the largest land carnivores of all time; the largest complete specimen, FMNH PR2081 ("Sue"), measured 12.8 metres (42 ft) long, and was 4.0 metres (13.1 ft) tall at the hips. Mass estimates have varied widely over the years, from more than 7.2 metric tons (7.9 short tons), to less than 4.5 metric tons (5.0 short tons), with most modern estimates ranging between 5.4 and 6.8 metric tons (6.0 and 7.5 short tons). Packard et al. (2009) tested dinosaur mass estimation procedures on elephants and concluded that dinosaur estimations are flawed and produce over-estimations; thus, the weight of Tyrannosaurus could be much less than usually estimated. Other estimations have concluded that the largest known Tyrannosaurus specimens had a weight exceeding 9 tonnes. T. rex takes this because it is more muscular, strong, power, intelligent, robust, protected, agile and faster than the Carcharodontosaurus. T. rex can kill ankylosaurus or even Triceratops without a question. So Carcharodonotsaurus is another easy meal, because it is so overrated and T. rex is better. That's... not really the case. If the Tyrannosaurus had an equal bite force, I'd be inclined to believe you. But with the amount of power behind those jaws, I dont think it is at any disadvantage. If anything, I'd consider the Tyrannosaurus' to have the most dangerous bite of any theropod. I'll quote myself. 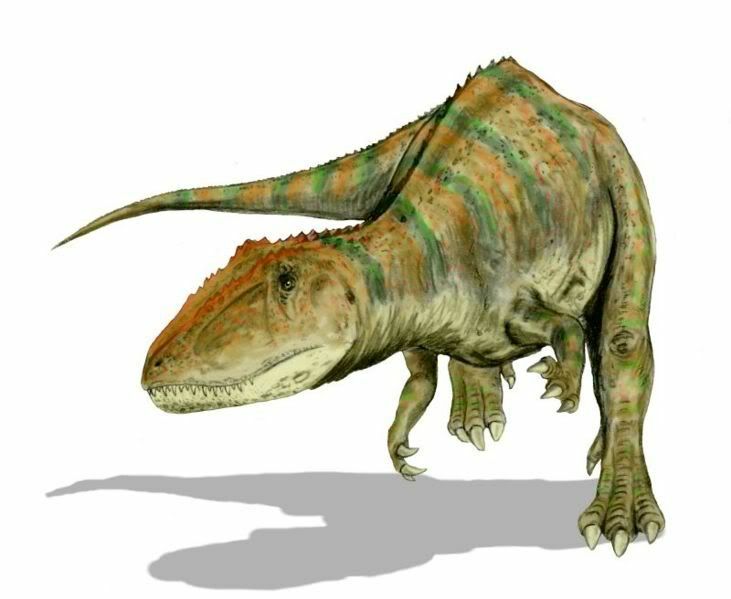 Substitute Giganotosaurus with Carcharodontosaurus, since they are extremely similar animals. (08-21-2018, 07:26 AM)Maxilla Wrote: These animals are fairly well matched, at least with the information I'm aware of. That being said, at parity I think I'd favor the Tyrannosaur more often than not. It just seems to have better tools in its tool kit for the job. I hate using this argument, but I do subscribe to the idea that whichever theropod commits to and succeeds in getting the first bite will have a notable advantage. Both animals have devastating bites in their own rights that could cripple their foe if landed in critical area. With a T. rex, I think more of the Giganotosaurus' body falls under the purview of 'critical area'. To be honest, there isn't a ton of information on the giant southern lizard and all we know of it's averages are guestimations. We know a lot about Rex, and as far as I am aware the average specimen seems to be around Stan's size (37-39 feet depending on your methods). Assuming the CM 930 or BHI 3033 (7500ish kg) represent the average T. rex and MUCPv-Ch1 represents an average Giganotosaurus (6800ish kg), even if the southern giant is longer overall, it would take a true giant like MUCPv-95's liberal estimate to outweigh the Tyrannosaur. For these reasons, I favor the Rex at 6-6.5/10. At least until more information surfaces about Giganotosaurus. Fingers crossed! Simply put, there's not much that a Carcharodontosaurus can do that a Tyrannosaurus cant do with equal or superior efficiency against another theropod. It should be noted that SGM-Din 1's estimations place it as even lighter than MUCPv-Ch1 at 6300kg. Assuming this represents an average, which is up for debate (although it IS the largest specimen that I am aware of), at average sizes we are considering a 6300kg animal against a 7500kg animal. If we treat SGM-Din 1 as a maximum size, we're comparing a 6300kg animal against a 8300-8800kg animal. That's almost a three ton difference. I wouldn't say that t-rex would easily win, but the chances are higher than those of a carcharodontosaurus. The bite force of carcharodontodsurus is weaker than that of a t-rex, but it still can deliver some significant damage. It was enough to take down a sauropod after all. Also, it's skull was 8 centimiters longer than a t-rex skull, but that's not a critical difference. I give 60%chance to tyrannosaurus. Note : Giganoto and Carcharodon has nearly the same body. Even Giganoto has more volume ..
T-Rex has far wider skull and far wider body . Has far more voluminous body . Also faster and agiler . ^ For Amaterasu's mercy, how about you help your public image on the forum and do something productive, eh? New members who spam like this are not well welcomed. 4. 3x a higher bite force and may actually be far more than that since even modern oteophagus animals (bone crunching) usually dont bite at thier maximum. 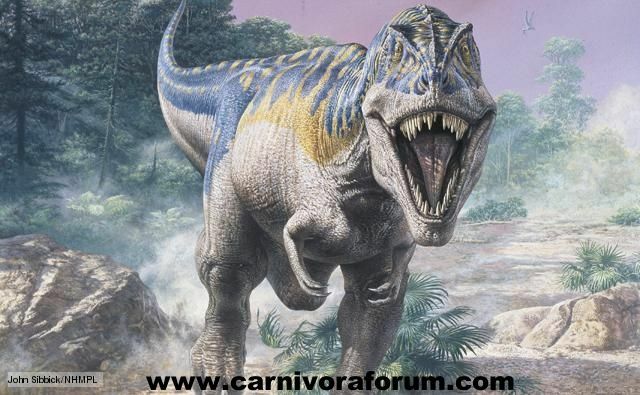 T.rex also had serrated teeth as did carcharaodontosaurs, i personally belive this is a mismatch the tyrannosaur just has too many advantages, one bite the whole entire fight is over , which would be quick due to the animal having more rotaional enertia even when it is larger. Both these animals would carefully place thier bites so a t.rex with a higher bite force and forward facing vision will easily bite a very vunurable area of the carch ending this fight in meer seconds. I have an idea carch would carefully place its bites because thats the only way it will do damage to the rex but due to having a less field of vision it has to worry about the t.rex not biting it by constantlly trying to keep its vison focused on the rex. At that point the carch is to worried about not being bitten in order to have or execute any type of offense, i would say carchs best chance would be to some how if even possible due the the higher agility of t.rex get behind it and attack its tail or behind the rexes legs, however dont forget the rex would be constantly keeping focus on the carchs head since that is usually the attack methods of therapods, but in the rexes case it can still keep its eyes focused while attacking.... now if the carch uses the head on skull biting approach on the rex which it may use since it would view the rex as another larg therapod its whole jaw would be devistated and this would be horrible for the carch since we know rex had boney armor on its skull. If a fight were to occur i simply think the t.rex would prey on the carch outright since the carch wont be doing as much damage as an equal size tyrannosaur. Since we have proof tyrannosaurs cannalbalized each other if your a 9ton t.rex who would hunt a 7 ton t.rex a 7 ton carch would be easier to take down but thats how i think a large t.rex would see a carch if they had lived side by side for years lets say 100 yrs in the same enviornment. In the same enviornment i use this example because atleast the carch is familar with the Rex and could have an idea of how to adress the situation. if you just randomly throw them both in, the t.rex will win within seconds bacause they were both apex predators and had little to no fear of anything and both would most likely outright attack each other over territoral disbute which highly favors the rex in a close combat situation. This fight would be far more interesting if they're at equal weight. But even the smaller T Rexes are quite bit heavier such as 7500kg for Stan, AMNH, CM9380 vs 6900kg for Charch. The Big boys like Sue, Scotty, Trix or Tristan are just too much at 8500kg - 9000kg range. But even at same mass, a T Rex would still look like a wrestler compared to a tall, lanky basketball player Charch and would still physically exert more power. Charch would really have to aim precise to to the neck or throat to have any chance of winning. While I agree with most of the points you've listed and favor the Tyrannosaur, I think you're underselling the carnosaur's bite. Both it and Giganotosaurus had bites that were capable of exsanguinating targets with bites that didn't particularly need a boatload of force behind them to be absolutely deadly. I think that a bite in any of the critical areas- the neck, areas of important muscle attachment, etc from either party would be perfectly capable of killing or crippling each other. That being said, I think that because of the nature of a Tyrannosaur's bite it wouldn't have to be quite as conservative when placing its bites. Not that either animal would have to be objectively conservative in the first place. While I appreciate your points regarding vision, these are both very large animals and it wouldn't be particularly difficult for either to attack the other in retaliation when both are in biting range. Quote: If a fight were to occur i simply think the t.rex would prey on the carch outright since the carch wont be doing as much damage as an equal size tyrannosaur. Since we have proof tyrannosaurs cannalbalized each other if your a 9ton t.rex who would hunt a 7 ton t.rex [...]. I don't quite agree with this. Intra-species conflict is different than hunting, and as far as I am aware there is no definitive evidence that Tyrannosaurus actively hunted other adult Tyrannosaurus. Conflict, for sure, but nothing remotely close to some sort of predator-prey relationship with adult members of its own species. I also think you're underselling how dangerous the quarry is. Whether it is a seven ton Tyrannosaurus or a seven ton Carcharodontosaurus it is still an extremely large, extremely well armed, and therefor an extremely dangerous prey item (didn't think I'd ever write a sentence with the context of either animals being prey). Giganotosaurus and Tyrannotitan both achieved weights similar to the average Tyrannosaurus while having lengths around the size of the largest Tyrannosaurus'. It's not too far outside of the realm of reason to assume a similar case would apply to Carcharodontosaurus. 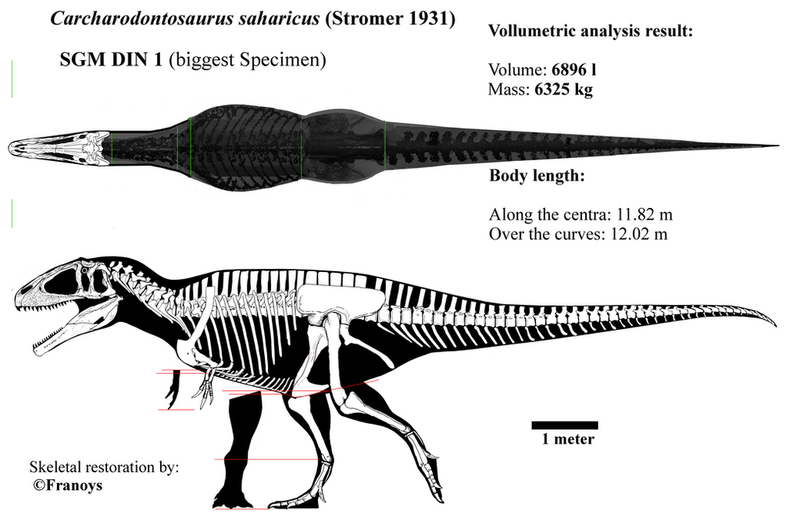 If anything, the carnosaur would be visibly larger than the Tyrannosaur (height-length) even if it was the same or slightly less mass. I doubt a predator-prey relationship would exist because the carnosaur would be an imposing target and would seem bigger (even if it wasn't mass wise) than all but the largest of the Tyrannosaurus' even if it was more bark than bite (comparatively, not objectively). This is all also assuming that SGM-Din 1 is a large specimen. There's always the likelihood it was an average individual and the big boys of its species are yet to be seen. Currently, I support Tyrannosaurus. I will probably still support Tyrannosaurus even if larger specimens of various species of carcharodonotsauridae are unearthed. This whole post is just a longwinded way of me saying that I think you're not giving the Carcharodontosaurus enough credit- because I think this hypothetical matchup is closer than you think. Current time: 04-22-2019, 02:59 PM Powered By MyBB, © 2002-2019 MyBB Group.